AK Experience Camp gives youth a chance to experience Alaska skills and adventure | Get Out, Sitka! The 2017 AK Experience Camp is fast approaching (June 5-9 at the Eagle River Scout Camp in Juneau), so it’s time to sign up your Southeast Alaska youth now. Registration is on a first -come, first-served basis, and members of the Sitka Spruce Tips 4-H Club will be attending. You can find the registration information and pictures from previous years on the Southeast Alaska 4-H website here. The camp registration fee is $300 and the 4-H enrollment fee is $25. The check for camp will need to be made out to Southeast 4-H and can be dropped off at the Juneau office of the University of Alaska Fairbanks Cooperative Extension Service at 450 Whittier Street, or mailed to UAF Cooperative Extension Service, P.O. Box 21266 Juneau, Alaska, 99802. There are scholarships available through Juneau Parks & Recreation and also through the Juneau UAF Cooperative Extension Service office. The 4-H fee can be paid via credit card online during enrollment in 4-H. We are still requiring the paper form of the registration for our camp, but families also need to enroll in 4-H Online. Please visit the enroll in 4-H page for details. After you have filled out the online forms you will pick a club and project. Select AK Experience Camp for the club and adventure/challenge for the project. If you have already enrolled at 4-H Online, please go into your youth’s account and select AK Experience Camp as an additional club. This helps us to keep up to date on the youth who get to go to our awesome camp. Special Invitation to Youth Leaders: We have created an opportunity for youth entering 10th through 12th grades to attend the Pre-Camp Teen Leadership and Adventure which is Wednesday to Friday, May 31-June 2, and is the new venue for our signature survival shelter overnight adventure. This training session prepares our youth leaders for assisting at camp and participation is by a special application (available upon request). 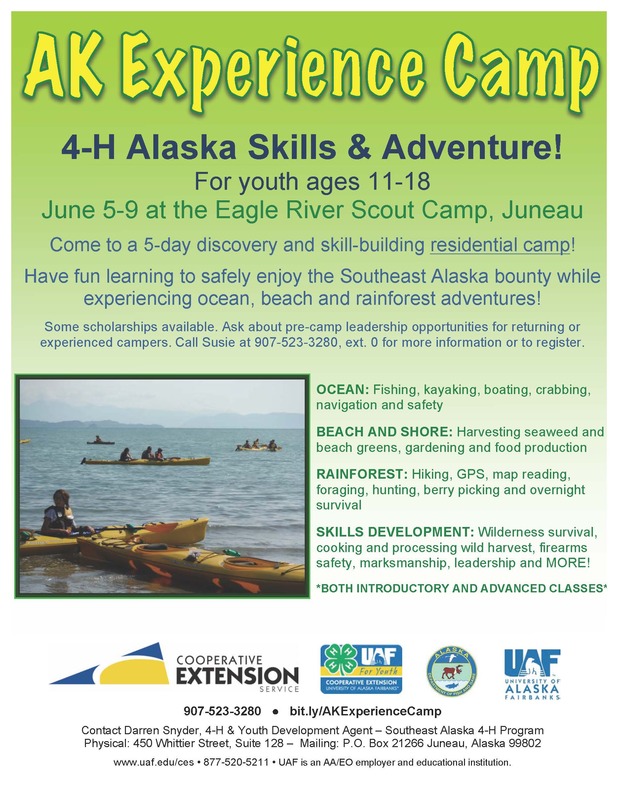 This camp is brought to our Alaskan youth by partners at the University of Alaska Fairbanks Cooperative Extension Service 4-H program and the Alaska Department of Fish and Game, with the invaluable help of a robust team of trained volunteers and professionals. The UAF Cooperative Extension Service is truly thankful for everyone who gives so much to make this camp possible. Thanks and we’ll see you at camp! This entry was posted in Kids and nature, Outdoor events, Outdoor programs and tagged 4-H Alaska Skills and Adventure, 4-H program, AK Experience Camp, Alaska, Alaska Department of Fish and Game, Darren Snyder, discovery and exploration, Eagle River Scout Camp, education, encouragement, firearms skills and safety, fly casting, get more kids outdoors, Get Out Sitka!, hiking, Juneau Parks & Recreation, kayaking, lure fishing, shooting, Sitka!, Susie Wilkie, too much time indoors, UAF Cooperative Extension Service, wilderness survival. Bookmark the permalink.